On the Island of Koh Samui, situated in the hill side above Fisherman’s Village on Bophut Beach, Villa Thara enjoys a grand view of Koh Phangan and Koh Matlan. The natural wonders which surround the villa are brilliantly complimented and featured in the creative and painstaking landscaping which frames the villa so elegantly. The entirety of the structure succeeds at both standing out as an eye catching land mark while doing nothing to compromise the integrity of the surrounding natural paradise. 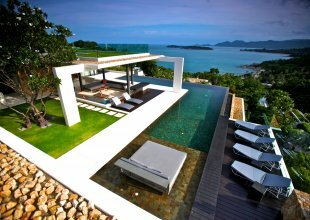 From the very first sight of its highly modern Thai architecture and stunning design, it is obvious that no expense has been spared to create the most wondrous villa experience possible. The beauty of this villa – inside and out – is sure to remain with anyone who experiences it for a life time. Divided into a master suite, three guest villas and a spacious living room, the villa is the perfect location for maintaining a group dynamic while allowing everyone their individual privacy. The centrally located, massive 22 meter infinity edge swimming pool provides a perfect centre piece for your stay, giving you an excellent place to relax or take a swim. The interior provides just as much excitement, beautifully and elegantly designed interior spaces provide a wonder for the eyes and comforts for the whole body. Fully equipped entertainment systems with WiFi, T.V., music and more are sure to keep everyone engaged. For relaxation, it is almost enough to be surrounded by such natural beauty and brilliant architecture. But to really bring an incredible relaxation experience, the villa has an onsite spa, with a professional spa therapist available twelve hours a day. The spa therapist joins the rest of the villas highly qualified, professional staff. 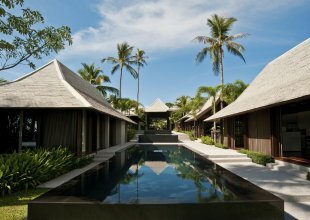 Four live in staff take up accommodation on the grounds away from the main villa, ready to assist with anything guests may require.